The following is a March 25 story by George Weigel on the Catholic World Report. Shortly after George Pell was named archbishop of Melbourne, he instituted several reforms at the archdiocesan seminary, including daily Mass and the daily celebration of the Liturgy of the Hours, both of which had fallen by the wayside in the preceding years. The seminary faculty, enthusiastic proponents of Catholic Lite, thought to call the archbishop’s bluff and informed him that, were he to persist in such draconian measures, they would resign en masse. The archbishop thanked them for the courtesy of giving him a heads-up, accepted their resignations on the spot, and got on with the reform of the Melbourne seminary—and the rest of the archdiocese. The defenders of the status quo in the Vatican may have been unaware of this episode when they recently tried to take down the man chosen by Pope Francis to clean up the financial mess the Argentinian pope inherited two years ago. Like their predecessors in Melbourne, the leaders of a nasty campaign of personal accusation against Cardinal Pell, conducted by leaks to the ever-sleazy Italian media, failed. I hope that failure will be a lesson to such scoundrels in the future: don’t mess with a former Australian rules football star who likes contact sports. That may be hope-against-hope. But we are obliged to believe that conversion, even among curialists native to the boot-shaped peninsula, is not beyond the power of God’s grace. Pope Francis was elected by a conclave determined that the next pontificate should clean up what Msgr. Ronald Knox used to call the “engine room” of the Barque of Peter. In the ensuing two years, there’s not been a whole lot of progress in curial reform. The striking exception to that rule is the result of the pope’s most successful reformist appointment: that of George Pell as head of a new super-dicastery in the Roman Curia, the Secretariat for the Economy, with a mandate to make the Vatican “boringly successful” as a “model of good financial practices,” as Cardinal Pell likes to tell reporters. Under the Australian cardinal’s leadership, the Vatican bank has been cleaned up and cleaned out. Proper financial procedures—no-brainers in most institutions but shockingly new in the tribal atmosphere of the Vatican—have been implemented. Budgeting and auditing are now conducted according to accepted professional standards. It was all, evidently, too much for some. And the entirely predictable personal attack on Cardinal Pell followed—the most risible part of which involved the spurious charge that the cardinal had spent large sums of Church monies turning himself into a clothes horse. (I have known George Pell for 47 years, since he spent a summer in my home parish in Baltimore between ordination in Rome and doctoral studies in Oxford; and I do no disservice to my old friend by noting that his sartorial style more readily evokes Salvation Army Thrift Shop than Brooks Brothers.) But calumny, alas, is what happens when people who have long thought of the Church as their private property, and perhaps even their private piggy-bank, run into a determined and incorruptible reformer who understands that financial probity is essential to our being the “Church in permanent mission” to which Pope Francis has called us. And that brings me to something else with which the scofflaws who attacked Cardinal Pell hadn’t sufficiently reckoned: he’s doing what he’s doing, not as a gimlet-eyed bean-counter, but as a disciple and pastor who, like the pope, understands that the Church’s proclamation of the Gospel is impeded when the Church’s institutional integrity is threatened by corruption: sexual, financial, or both. 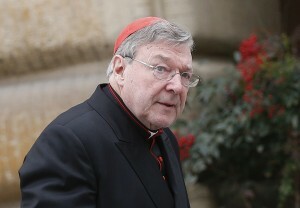 George Pell remade the Catholic Church in Australia (which, pre-Pell, was headed in the direction of the moribund local churches in the Netherlands, Belgium and Germany) by reforming Catholic institutions that had become sinecures for time-servers rather than launch-pads for the new evangelization. He’s now doing the same in Rome, with the unstinting support of Pope Francis. Some might call Pell’s job “mission impossible.” I say, in proper Aussie, “good on ‘im.” And to those of a wagering spirit—don’t bet against him. Perhaps the Archbishop of SF could learn from Cardinal Pell and just accept the resignation of the opposing faculty and start over with a new faculty next fall. I agree with you Bob One the good Archbishop should purge the schools and replace them all with Faithful faculty,, call the liberals bluff. I wonder how the job fair went that was held to recruit teachers for the archdiocese? I hope there were lots of good applicants! God bless Cardinal Pell – a wonderful leader in the Church. That’s one good way to get rid of the heretics – accept their resignations. If they won’t resign – fire them. That is what Pope Francis needs to do with many of the German Cardinals – accept their resignations. I agree, Bob One, and Maddie! Abp. Cordileone should inform these worthless employees, who could care less about Jesus Christ and His Church— that he is ready now, to accept their resignations! And ready to replace them, with good, orthodox Catholic teachers, eager to teach and be good role models, for their beloved Catholic Faith! Cardinal Pell is just wonderful! Maybe Cardinal Pell could give some lessons to Pope Francis, on how to effectively and correctly run the Church!! Cardinal Pell, keep fighting for the reforms even if you do not receive the support which you give! It is nice to see an article about a REAL Man, a REAL Leader, a REAL Father – who knows right from wrong, advertises what’s right, and follows through with what’s right. a) CLEAN UP ALL SEMINARIES so that they use Sacred Scripture, and the Catechism of the Catholic Church (1997) which contains the Doctrine of the Faith, as Required texts. and it is their responsibility to correct Laity abuses of the Liturgy. a) REQUIRE all Diocese and Parish web sites to prominently promote the reading of a Catholic Bible and the CCC by the Laity at home. b) Explain from the pulpit and parish bulletins to all Laity that they may never commit SACRILEGE against the Body and Blood of our Lord by receiving unworthily (in the state of Mortal Sin) – 1 Cor 11:27-30; Mt 7:6; CCC # 2120, and CCC #1415. SACRILEGE against Body & Blood of Our Lord. Mac, you imply that the five years in seminary for priest formation doesn’t include the Bible and the CCC. Really? Have you ever gone on line to check out the curriculum for an American seminary? Do you understand all of the courses in theology, scripture, etc. that a potential priest must take to get his degree? To suggest that seminaries need to teach Scripture and CCC is too simplistic. That is what seminary is all about. An answer to my prayer. God bless him. We can learn so much from the Liturgy of the Hours, which contains so many writings of the early Church Fathers and the Saints. Excellent leadership music to the ears of the faithful in California and throughout the world. God bless Cardinal Pell. Even Ronald Reagan fire the air traffic controllers when they went on strike. Pray that Pell is pope one day, and that he cleans the sodomite “fifth” out of the Church.